Precipitation has been rather spotty and light this morning and mid-day, but it will increase in intensity later this afternoon as an “initial” cold front arrives in the I-95 corridor. Any mixed precipitation this afternoon should change to all snow by late in the day in the DC-to-Philly corridor and then later this eveining in the NYC metro region. Snow should continue for awhile this evening and end before midnight in most I-95 corridor locations as the cold front slides off the east coast. Untreated road surfaces can get slick in a hurry later today and early tonight as temperatures drop and the snow falls. The true Arctic frontal boundary will slide through on Wednesday and it could be an active frontal passage. Winds are likely to gust to 40 mph or so as the front arrives and there can be snow showers in the I-95 corridor. In addition, a few heavier snow squalls could accompany the frontal passage which could produce a quick half inch-to-an inch of accumulation in any given location. The best chance for snow on Wednesday in the DC-to-Philly-to-NYC corridor will be between the hours of 10AM and 4PM. 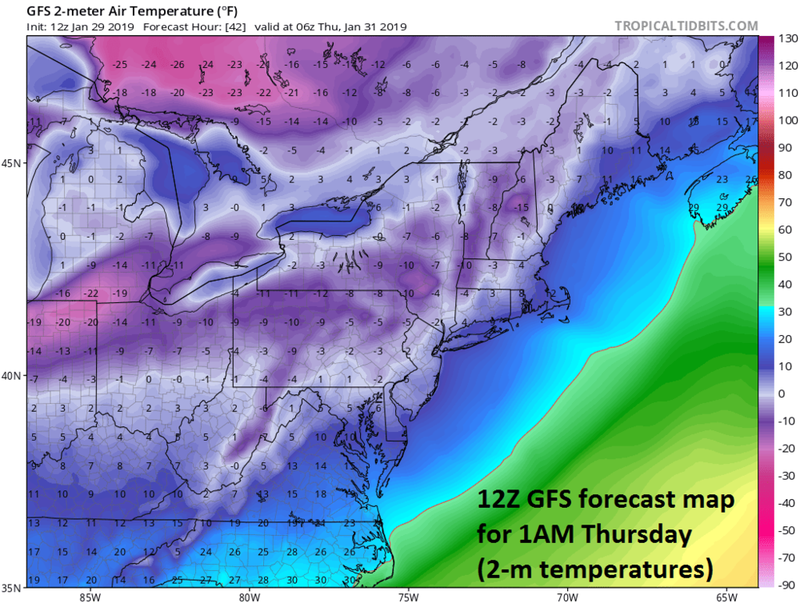 The full brunt of the Arctic blast for the I-95 corridor will arrive on Wednesday night. Temperatures will plunge tomorrow night and winds will remain strong out of the northwest. By early Thursday, temperatures should be near zero in many suburban locations and wind chills will be well below zero. Afternoon temperatures on Thursday will struggle to climb through the teens and then they should drop to single digits once again later Thursday night. It remains well below normal on Friday and another low pressure system will head our way from the Midwest. This next system could produce another small accumulation of snow in the Mid-Atlantic region as we close out the work week. It stays cold on Saturday, but then much milder air is likely to return here early next week.